Stylish and functional, the new 5440 Professional 4.0 self inking dater has an impression size of 49 x 28mm + date size 4mm. The stylish self inking dater features a new high quality brushed stainless steel finish accentuating a professional look with added durability. Customise the stamp with your own impression which allows up to 4 lines of personalised text, 2 above and 2 below the date. Complementing the robust stamp, an ergonomic handle and cushioning elements reduce vibrations guaranteeing a better imprint. 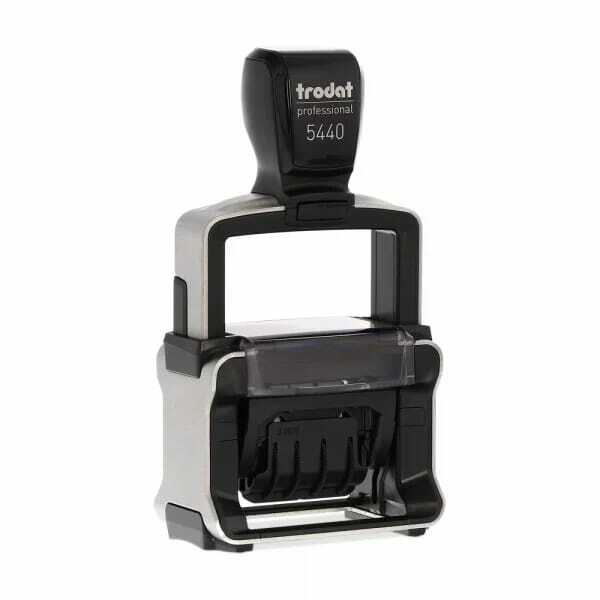 Customer evaluation for "Trodat Professional Dater 5440 49 x 28 mm - 2+2 lines"